Aside from the heat, you know it’s June when Ellen blooms! My crinum ‘Ellen Bosanquet’ is another survivor of droughts and extreme freezes. Another tough plant through drought and last winter’s kabosh is my 2-year-old ‘Patrick’s’ abutilon (Abutilon pictum ‘Patrick’s’), named for designer Patrick Kirwin, who took a cutting to Conrad Bering at Barton Springs Nursery. Not so long ago, abutilons were a garden novelty, since we questioned their survival status in winter. For sure, some of us lost them when it plummeted to 10°. But most of them were fine, including Pam Penick’s ‘Marilyn’s Choice’ at Digging. Since a lot of us are new to abutilons, this week on CTG, Tom meets with Mae Sanchez from Barton Springs Nursery to give us some tips on their care. I didn’t realize that they come in many sizes, like the Bella Red she features: a smaller, more compact variety. Mae shows off taller specimens, too, like this luscious pink that’s a recent addition to Robin Mayfield’s garden at Getting Grounded. Get Mae’s plant list and details for these enchanting additions to your garden, even in part shade. This week, Daphne answers Heath Weber’s question on his chitalpa trunk splitting. Chiltalpa is a cross between Catalpa bignonioides and Chilopsis linearis (desert willow). Get Daphne’s answer about this situation and all her tips. And thanks, Heath! On the hit list of top questions: tomato problems. This week, Trisha tackles the insects that are pestering you, including leaf miners and problems like blossom end rot and early blight. Get her detailed list to help you navigate tomato torments! Even though the tomato hornworm is especially destructive, you really have to admire this one from Lee Clippard, who blogs at The Grackle. If you can re-locate some to a honeysuckle, including the native coral honeysuckle, you’ll end up with pollinating sphinx moths, often called “hummingbird” moths due to their size. I’m sure that the leaffooted bug MUST have a beneficial purpose in this world, but tomato growers know it as a major headache. They mottle the fruit by sucking it, making it inedible. Garden blogger Mostly Weeds has an attractive specimen that had a moment of fame before he met her “Bucket of Death”. Spider mites, a type of arachnid, are bad news on tomatoes and other plants as we head into hot, dusty weather. You may not see them right away. Most likely, you’ll see spotted leaves, like this advanced stage from Wizzie Brown, Texas AgriLife Extension entomologist. Check out her blog for what else is bugging you. 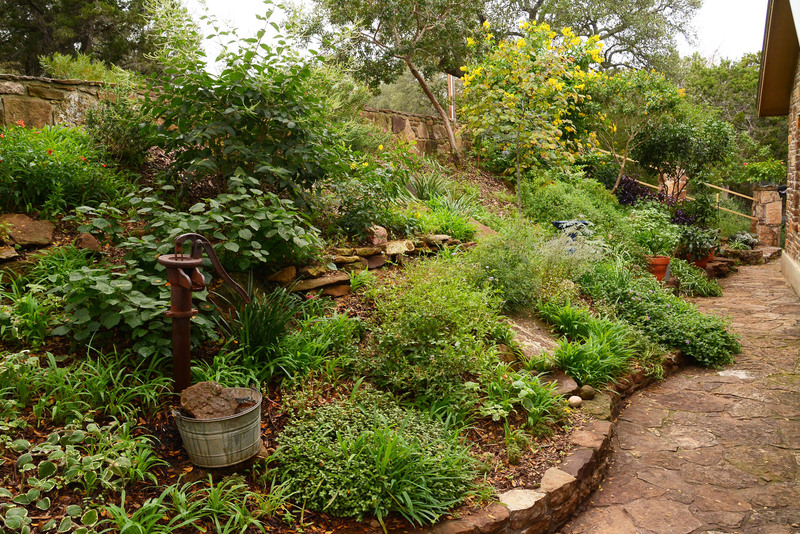 On tour, take a ride through the 1920s Hill Country on Steve Blackson’s garden railroad. And yea, you can watch online, too!